We continue our look back at the 1984-85 season with a focus on that year’s European campaign. Everton’s greatest team of all were marching towards the Division One championship, when they were drawn against German giants Bayern Munich in the semi final of the European Cup Winners Cup. Bayern Munich were considered by many to be the best side in that seasons competition and still featured some of the team that had won three consecutive European Cup finals in the mid 70’s. However, they hadn’t come up against a team as good as the one built by Howard Kendall for sometime and left England bewildered by Everton’s brilliance. For Evertonians of a certain generation it is known as the greatest Goodison night of them all. Many younger Blues have grown up on tales of Bayern Munich and the night the Gwladys Street “sucked the ball into the net”. After securing a creditable 0-0 draw away in the Olympic Stadium in Munich, just under 50,000 Evertonians crammed into the famous old stadium for the return leg at Goodison, knowing that an Everton victory would make the Blues significant favourites to secure their first European trophy. The night didn’t all go to plan and despite outplaying their German opponents, Everton went in at half time trailing by a single goal, conceded shortly before half time. Everton knew they needed to score at least two goals to progress with Bayern now in possession of a crucial away goal. Rather than panic, Howard Kendall provided an impassioned half time team talk, telling his players that if they continued in the same vein, the Everton supporters would do the rest and cheer their heroes in Blue to victory. The story is best told by Ken Rodgers, with an extract of his book ‘Goodison Glory’ included within “The Official Everton Autobiography”. Everton gave one of the greatest club sides in Europe a one goal start in this finely balanced second leg and then battered them into submission with a breathtaking display of power. 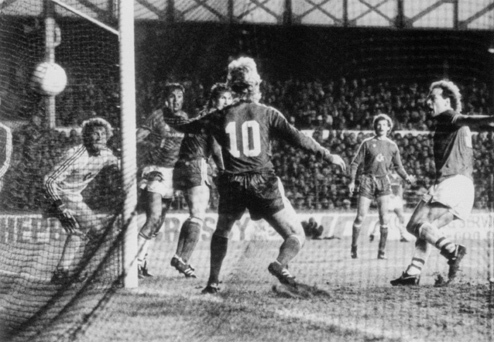 Goodison exploded as goals from Graeme Sharp, Andy Gray and Trevor Steven broke the hearts of Bayern Munich. The West German league leaders thought they had the tie in the bag when Dieter Hoeness squeezed them in front after 37 minutes. But Everton, inspired by 11 heroes on the pitch and 49,000 never-say-die supporters on the terraces, hit back with a vengeance. The courage, determination and commitment that inspired the triumph and earned a final clash with Rapid Vienna was epitomised in the displays of the goalscorers. Sharp and Gray gave the Germans a pounding with as bold a display of front running as you will see. It was the very best of British in terms of aggressive centre-forward play. They were awarded with a goal apiece in the second half when Bayern were on the rack and on the run with the Evertonians roaring their men forward. If that wasn’t enough, Steven brought the house down four minutes from time like some latter day Bobby Charlton, racing clear and unleashing an unstoppable shot from the edge of the box that flew past Belgian international keeper Jean-Marie Pfaff. On the final whistle, Gray was last off the pitch. He thrust his fists high into the air and the cheer must have rattled the Bayern dressing room door as they sat disconsolate, reflecting on a remarkable game. Everton: Southall, Stevens, Van Den Hauwe, Ratcliffe, Mountfield, Reid, Steven, Sharp, Gray, Bracewell, Sheedy. Everton went on to secure the trophy, beating Austrian side Rapid Vienna 3-1 in the final. The final was something of an anti-climax, with the travelling Evertonians already well aware that the hard work had been done at Goodison. I am sure everyone has seen the highlights of the Bayern game, but this extremely rare footage, filmed from the Goodison Road side of the ground, brilliantly captures the electric atmosphere inside Goodison Park as Everton powered past Bayern Munich in the second half of the Semi Final.